Thus was I arrested, in a town in far west Uganda, in the foothills of the Rwenzori mountains, close to the equator and to the Democratic Republic of Congo, but 300 kilometres from Kampala and anybody who knew who I was and might be in a position to help. The date was October 2012 and the place was the main police station in Fort Portal, the administrative capital and principle town of the Kingdom of Toro. This was how I came to meet Kukundakwe Patrick, the Detective Sub Inspector who had just apprehended me, and through him Elius Muhimbise. Patrick and Elius are cousins but call themselves brothers. 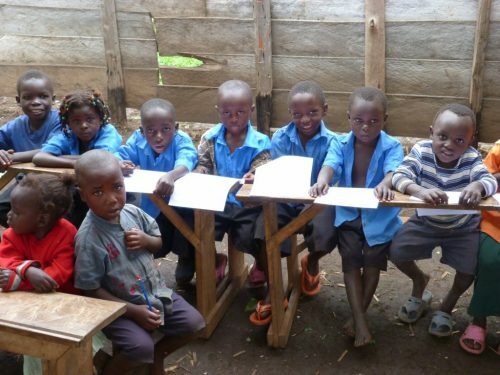 Elius runs a kindergarten and primary school in Iruhuura, a remote village in the crater hills 35 kilometres south of Fort Portal on the edge of the Kibale Forest National Park. He had founded the school with Patrick as his business partner a couple of years earlier. On this day he was in Fort Portal, and once the being arrested thing was over and done with, Patrick correctly surmised that if Elius came up to meet me then there was a possibility of a much more pleasant and entertaining connection being formed. Both Patrick and Elius are widely read and interested in the world beyond, and the chance to meet a mzungu (white man – not used as a derogatory term, just a generic statement of the obvious) with connections to their home and who liked to talk, was too good to pass up. And a very enjoyable and fruitful meeting it proved to be. I subsequently contrived through my work as a pilot on the British Airways Boeing 767 fleet to find myself back in Uganda regularly over the next 14 months including eight trips out to the west to Toro. The Kingdom covers much of the Ugandan side of the Rwenzori mountain range – the fabled Mountains of the Moon – and foothills, stretching eastward beyond the Kibale Forest. It is also where I spent most of the first five years of my life. I hadn’t been back for over 50 years so I was returning to find my old roots and to try to reconnect with the country and its people, a process which has been successful beyond my imagining. A big part of that process has been the story that started with that first nerve-wracking encounter with Patrick, as I would go on to meet up with one of both of them on each of my return visits. I very quickly began to feel at home as I explored the region, finding the houses we had lived in – particularly one in Kilembe where I spent the greater part of those years. Kilembe, where my sister Karen was born, is a former mining town and local administration centre some 90-plus kilometres south of Fort Portal in a beautiful deep valley in the mountains. I was also discovering a country of superb scenery, still home to lots of wonderful wildlife, and also to possibly the nicest, friendliest people – even those living in what to us in the “first” world is grinding poverty – that I have met anywhere. It was a particular pleasure to introduce Patrick and Elius to my parents Eileen and Jock Macdonald when we were able to take a short holiday in Uganda in March 2013 (their first time in the country since 1962). They met a few times during the week that we spent in the west, and there is something of a bond that has grown between our families, with the guys considering themselves to be the local representatives of the Macdonald clan. This is all very nice and Disney Channel/Hallmark Cards, I hear you say, but what’s your point? After a year, including half a dozen drives up the wonderfully scenic road from Kampala to Fort Portal, Kilembe, the Queen Elizabeth National Park and all points west, in October 2012 I finally made it down those 35 kms into Kasenda sub-county, down a two-lane dirt road, and then a one-lane dirt “road”, into Isunga parish to the village of Iruhuura itself, to see the school that Elius had been telling me about all this time. Despite it being a Saturday and much to my surprise, around ninety of the then 108 pupils, aged three to seven, were there for me to meet – and to see me, you don’t get many wazungu down that road! Four of the five other members of staff were there also. The school I found amounted to the walls of a pair of wooden buildings divided into five rooms, one building partly roofed in corrugated iron over the two useable classrooms; there were no doors or windows, and the floors were just bare ground. There were a few sets of desks and benches, not nearly enough, and three blackboards. The playground was unlevelled grass with two truck tyres for equipment. I also found a wonderful bunch of cheerful, friendly, curious, well behaved children. Despite it being the weekend several of them were in uniform, many others were in their “Sunday best”, particularly the girls. 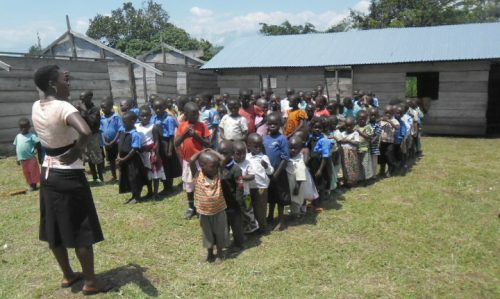 Once we’d all met, the children retreated to the two classrooms while I talked with Elius about his plans for the school. We were soon interrupted however, as both classes launched into a clapped song of welcome for me. I was, to say the least, somewhat taken aback! Later the children came back out and put on a drill for me, including a rendition of the Ugandan National Anthem complete with actions, and then there was a period of play and snack time for which I was pleased to buy them all some of the oh-so-flavourful locally grown bananas from a little duka (shop) in the village. After that there was a performance of a farewell song, and then they all left for their walks back to their widely scattered homes. Wow! I only went there to see the place and get some photos of it to take home… like Fort Portal police station. I was completely bowled over by these lovely children, and by Elius’ tale of his long-standing ambition to establish the school and secure a permanent site for it. His aim is to provide the benefits and opportunities that education brings, and that he sorely missed, to his home district that has been poorly served until now, with special emphasis on inclusion for the girls and for orphans, of whom there is a terribly high number in Uganda. He scrabbled and travelled and worked his way up through the system to the achievement of a certificate in business administration, and a teaching diploma from Makerere University, but always with the aim of bringing schooling to the people of his home. I resolved to try to do something to help this project, to see if I could find a way to supplement all the hard work and enthusiasm with a little material assistance. Another visit the following month allowed me to see the children at work as it was a school day, in fact a day of national curriculum exams. The contrast between the rudimentary and only half-built school and the hushed and formal atmosphere in the rooms where the exams were being sat, so familiar to all of us, was marked, as was the disarming cheerfulness of those kids who had been “let out”. Elius gave me copies of a report on Uphill that he had prepared for me; its history, mission and goals, current situation, plans for the future and a costed wish list for the development of the school and facilities. The total sum, covering all that was required to complete and equip the buildings, classrooms, playground, library, facilities and accommodation came to less than one day pupil’s fees for a year at an independent school in Scotland. So, armed with this information, and fired up by the energy and enthusiasm of the staff and children, which is probably the worst point to start a project like this as judgement is inflamed by the crusading do-gooders zeal without being balanced by a good drenching of practicality, I returned home determined to “do something” to help, and to explore the possibility of trading on my family history and persuading my old school, Dollar Academy, and my friends and family, to help. Some of what has been achieved in just a few months can be seen below. We have paid for the roof to be finished and money donated by the Dollar Academy Charities Committee in 2013 bought the classroom furniture, as stipulated by the committee, and also paid for the weather-proof paint that has both protected and greatly enhanced the school.